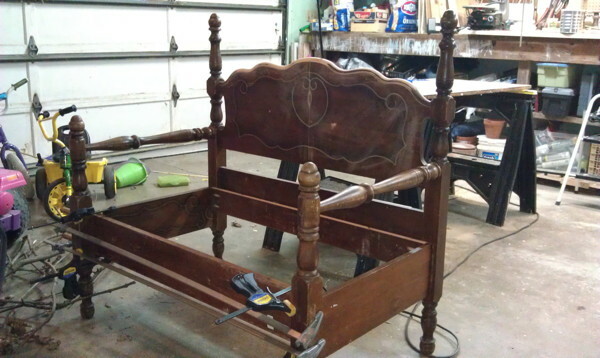 Project to turn a thrift-store bed frame into a bench for our front porch. This was really my wife’s project, I just did the fiddly bits. 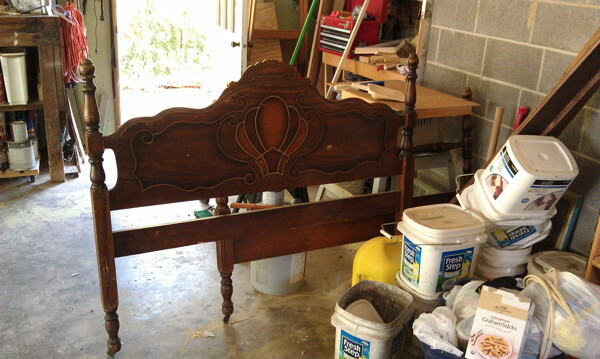 The headboard. 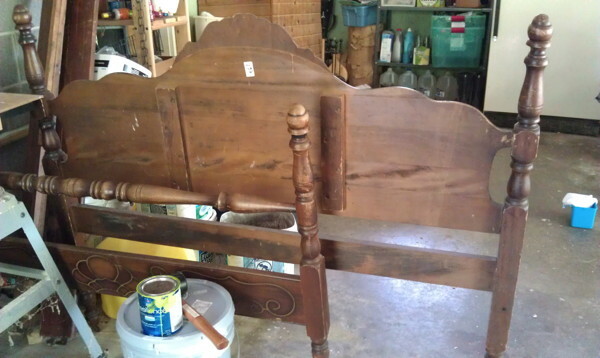 We ended up getting this bed frame for free. I wasn’t sure about this project but my wife had a pretty clear vision. 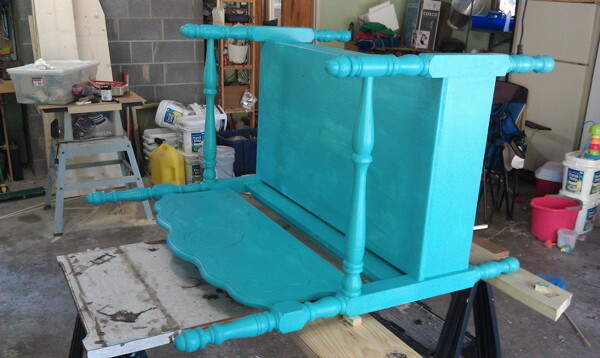 The footboard. The side rails are in the background. 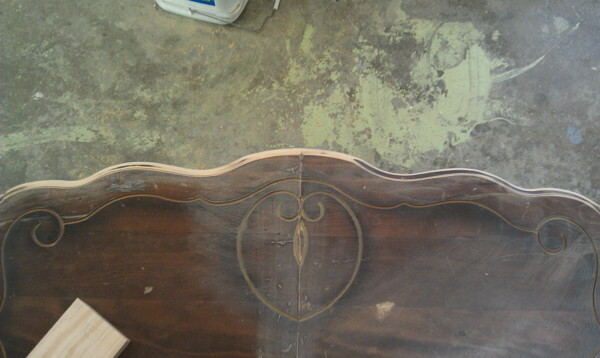 Step one was cutting the middle out of the headboard and rejoining at the width that fit where my wife wanted to put it. Joined the two sides with some dowels, and at some point I think I added a 1x across that gap for extra stability. 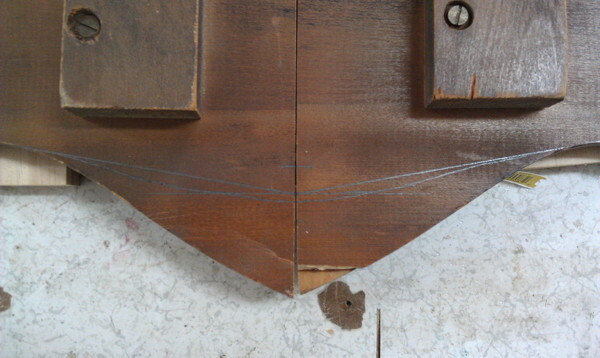 The top of the headboard didn’t meet in a pleasing curve after the join. These are some tentative plans for reshaping it. After reshaping the top curve and a bit of sanding. 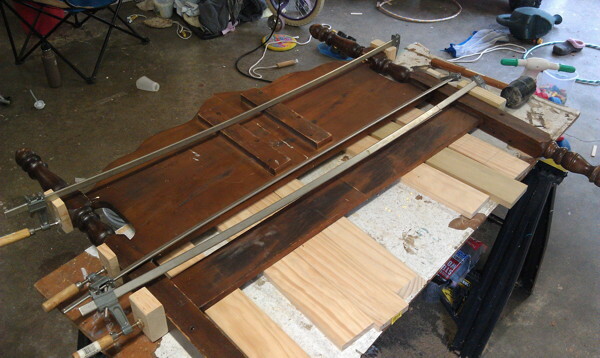 The footboard cut in half and down to size to be arms/front legs. 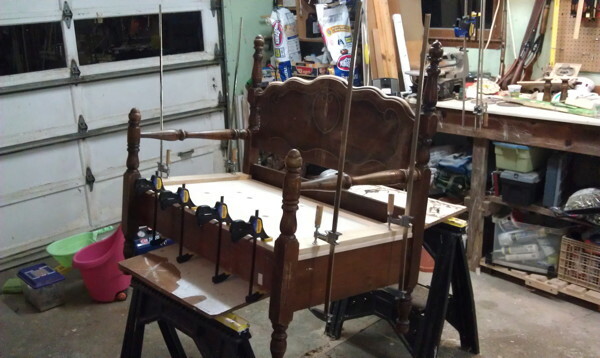 Attaching the footboard arms to the headboard back. Adding a front and back rail which will support the seat. 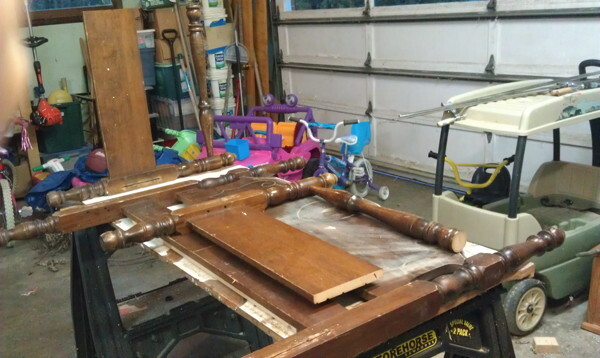 These pieces were cut from the bed’s side rails. Adding a couple of cross pieces for more support. 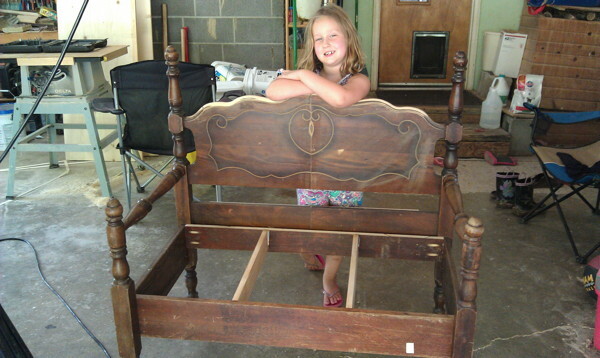 These are the first pieces that aren’t from the original bed. Little girl added for scale. Gluing on the seat. The seat was made from joined 1x12s, plus maybe an addition strip. 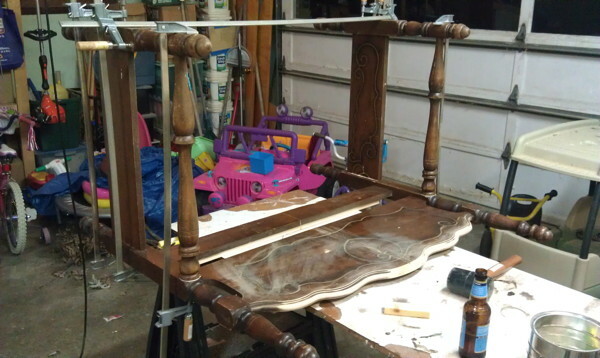 It was then doweled onto the bench to add some rigidity. 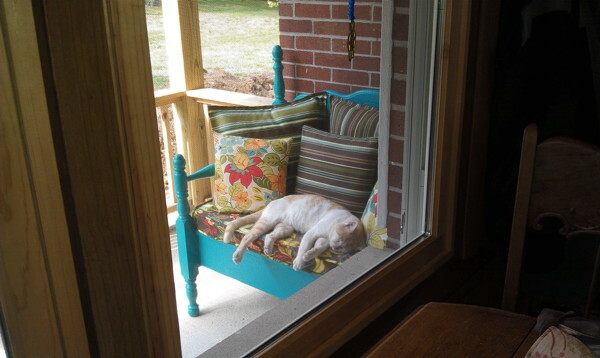 I don’t have any very well staged pictures of the finished bench with pillows, so I thought I’d include a picture of the bench in its most common use – a cat bed. This is Buddy the wonder cat taking a nap. 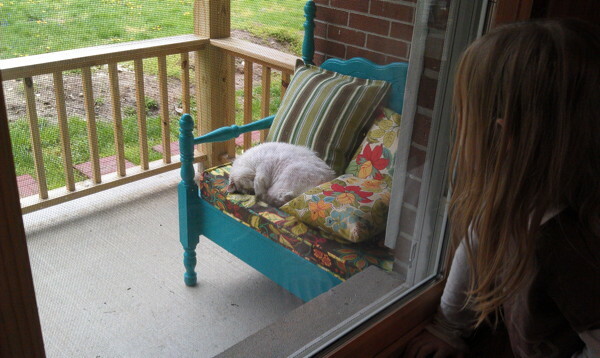 And here’s Simon taking a nap. This was a great project, I was genuinely shocked at how well it turned out. My wife had a clear vision for how she wanted this to turn out and I didn’t get it at all, but I did what she asked and got an amazing result.